Horse-chestnut tree leaf infected by a miniature caterpillar called Cameraria ohridella. Statue on avenue Charles Risler in the Champ de Mars. 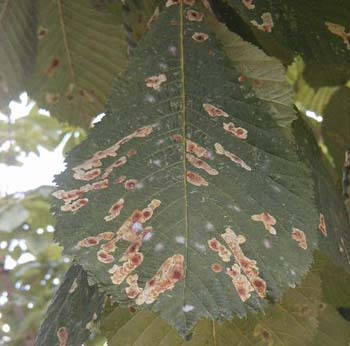 The ubiquitous horse-chestnut trees in Paris are ill. In fact, this is happening all over France. The culprit is a miniature caterpillar, a leaf miner, called Cameraria ohridella. The photo at left shows leaf damage caused by this creature in July. By now, many leaves have turned completely brown and are falling from the trees. That, plus some slightly cooler-than-normal weather, gives an autumnal feel to the parks and broad avenues. The origin of Cameraria ohridella is not known. It was first detected in Macedonia about twenty-some years ago. It entered France around 1998 by crossing the German border. A team called Controcam, a part of the National Agronomy Research Institute (INRA), based in Orléans, is studying how Cameraria ohridella spreads. INRA recommends that the fallen leaves be removed completely because it is there that the chrysalis of the Cameraria ohridella spends the winter, then hatches in the spring. Currently, the European researchers have not found any natural enemy of Cameraria ohridella capable of limiting its development. Only when they find this critter’s place of origin will they be able to find its natural enemy. Other sick tree news: The last bastion of the Elm tree, the island of Guernsey, has succombed to the fungus that we know as Dutch Elm disease. This fungus originally came from Asia, and made its way to Europe. The European form of the fungus travelled to North America, where it mutated. The mutated form then made its way back to Europe. It is spread by wind and flying beetles. - trees in the public forests of Boulogne and Vincennes (300 000). If you’d like to see some nice photos of Paris, check out this link. I think these photos were taken last year. This morning I walked all the way through the Champ de Mars and up to the construction site of the Musée du Quai Branly. Unbelievably, this museum’s web site claims the museum itself will open in 2006. I don’t think so. It looks very interesting, very modern, but as yet very incomplete. This museum has been under construction for at least 8 years – ever since we’ve been coming to Paris for the summer. Well, we shall see what happens next year. Do check out the museum’s web site by clicking on its name, above. It looks quite promising. On the way home, I saw the sign for rue du General Camou. 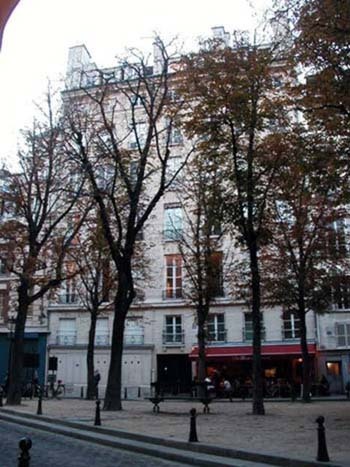 Remembering that this street is the site of the American Library in Paris, I decided to see what was happening there. The library was closed, although its posted hours clearly indicated it was supposed to be open. A small book rack loaded with books was tied to the security gate at the library’s front door. On it was a sign that said “free books.” So I checked it out. I found two books, one from the 1940s and one from the 1960s, that looked somewhat interesting, so I took them with me. The older one was a reader for college freshmen’s composition courses, much like Tom’s Norton Sampler. The other was Dame Edith Sitwell’s autobiography, with her obituary pasted in the front. The weather has been just gloriously wonderful. Sunny, high temps in the 70s, lows at night in the upper 50s (Fahrenheit). The days are getting shorter now, so the sun isn’t waking us at a ridiculously early hour. Our strolls home after dinner are always full of nighttime Parisian scenes. With so many Parisians gone on vacation, there is less traffic and everyplace seems much calmer. The local fromagerie (cheese shop) is actually open for the month of August. So I’m rewarding them by buying cheese there instead of at the grocery. The fromagerie has more and better options. Fromager: Good day, madam. Do you desire some cheese? Me: Good day, sir. Yes, some roquefort, please. It is for eating with pears. Fromager (leading me to the part of the store where various roqueforts are located): Here we have one type of roquefort, a bit milder, and here we have another type, a bit cruder, stronger. Me: I’ll take the cruder one. Fromager: Very good. Is this the right amount? Me: That’s perfect. (I pay him 4.5 euros.) Thank you very much. Fromager: Thank you! See you soon. Bye. Almost leafless trees in August, on the Place Dauphine on the Ile de la Cité.